Moss Park is a residential neighbourhood located in downtown Toronto, Ontario, Canada. The area known as Moss Park is typically considered to be between Jarvis Street and Parliament Street south of Dundas, an area dominated by public housing projects. 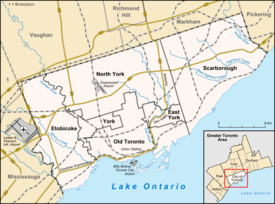 According to one set of boundaries of the City of Toronto it is roughly L-shaped, bounded on the north by Carlton Street to Parliament Street, on the east by Parliament Street to Queen Street East and the Don River, on the south by Eastern Avenue and Front Street, and on the west by Jarvis Street. This larger, view of the neighbourhood includes the neighbourhoods known as Corktown and the Garden District and a portion of Cabbagetown. Moss Park was the original estate home of Allan family who was born in Moss, near Huntly, Scotland. The original home stood on the west side of Sherbourne between Queen and Shuter until demolished during the 'urban renewal' redevelopment of the area into a housing project with a large park and community centre on the site of the old estate. During the 1960s, several buildings were demolished to make way for three large towers. Much of Moss Park was originally built to supply homes for the workers of the industrial area to the south of the neighbourhood. In the 1960s a large swath of these buildings were demolished to make way for the Moss Park public housing project, a group of three large towers at Queen and Parliament Street run by the Toronto Community Housing Corporation. The area immediately around the housing complex is the area today typically meant when referring to Moss Park. This neighbourhood is almost exclusively rented out and houses many low-income families. According to Toronto Life "Moss Park has long had a reputation among Torontonians as a notoriously downtrodden and dangerous neighbourhood." It is home to several homeless shelters. The northeast corner of Jarvis and Queen is occupied by Moss Park Armoury, which is used by several regiments of the Canadian Forces Primary Reserve. These include the 25 Field Ambulance, the 48th Highlanders of Canada, the 7th Toronto Regiment Royal Canadian Artillery, and the Queen's Own Rifles of Canada. Several cadet units also use the facility. Along Queen Street, the predominant building style is the three to five-storey building, with retail businesses on the ground floor and walk-up apartments on upper floors. The 501 Queen Street and 505 Dundas Street streetcar routes operate east-west in the neighbourhood. Bus routes include the 75 Sherbourne along Sherbourne from Rosedale to Queen's Quay, and the 65 Parliament Street bus from Castle Frank subway station south to the Esplanade.